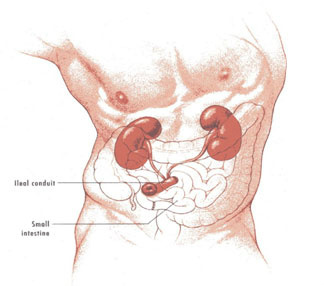 The most common type of urostomy is an ileal conduit which is usually sited on the left side of the abdomen. This involves using a short segment of the small bowel (ileum) being used as a tube or conduit to form a stoma through which urine from the ureters is diverted. This is usually after a persons bladder and/or urethra have been removed and is permanent. As part of the small bowel has been used to create the stoma, you may see a thick white mucus in the pouch. This is produced by the ileum and is normal. After the operation you may see the stitches that have been used to hold the stoma in place. These will eventaully dissolve away as the stoma shrinks over time. One of the most important things to remember is to take good care of the skin around the stoma. If the pouch does not fit snugly around the stoma the skin can become exposed to the harmful effects of the urine. Leakage, as well as the too frequest removal of the pouch and the use of harsh skin cleansers can also cause some irritation of the skin. Look at the skin around the stoma when changing the pouch, if you notice any swelling, rash or redness which does not go away after a couple of changes, please get in touch with your stoma care nurse. It is a good idea to try to establish a routine for changing the pouch. As you get used to your stoma you may find that at certain times of the day it is more active than at others. Try to choose a time when it is relatively inactive, perhaps first thing in the morning. Always empty the pouch before changing it. Before starting to change the pouch make sure you have everything to hand that you will need to complete the process. Check you have everything you need: wipes, warm water, a new pouch, any accessories and a disposable bag. Remove the old pouch, working slowly and gently from the top to the bottom. Wash the stoma and the surrounding skin with warm water and wipes. Dry the area well with the wipes. Fit the new pouch making sure it is secure all the way around. Place the old pouch into the disposable bag, seal it and put in the dustbin. Do not try to flush it down the toilet as this will cause a blockage. Remember to wash your hands after emptying or changing your pouch. As the urine will flow constantly from the stoma it is necessary to wear urostomy pouch. These have a drainable outlet at the bottom so that it can be emptied as often as necessary. These pouches have an anti-reflux valve to prevent urine flowing back towards the stoma and can stay on for 2-3 days. Generally it is a good idea to empty the pouch when it is about a third full. At night, a length of flexible tubing can be attached to the drainage valve on the pouch to allow the urine to flow into a larger appliance (night drainge bag). Many people find this preferable to getting up during the night to empty their pouch. There are many different sorts of pouches available and your stoma care nurse will be able to help you choose the most suitable type for you. There are two main types of pouches available. These are known as the a one-piece and the two piece systems. A one piece comprises of a single unit which is made up of the collection bag and the adhesive area which firmly attaches the pouch around the stoma. The two-piece system has the collection bag separate from the adhesive area and the two halves are then connected together. This means that you do not have to remove the adhesive part from around the stoma every time you change the bag. On leaving hospital your stoma care nurse will provide you with enough pouches and other necessary supplies to keep you going until your own supply is organised. The nurse will give you the necessary codes for your specific requirements and these should be given to your GP who can issue you with a prescription. This prescription should be taken to your local pharmacy who will then obtain the items for you. Stoma care supplies are covered by the Medical Card and by the Drug Payment Scheme. Be careful not to store your equipment in direct sunlight or near heat as this may make them deteriorate. Most people with a urostomy can eat a normal diet although certain foods such as asparagus and seafood may cause the urine to have a strong odour. You may have to increase the amount of fluids you drink, ideally up to 4 pints of water per day to keep your kidneys functioning properly. Remember that alcohol will make you pass more urine - as it did before your operation. People with urostomies can be more prone to develop urinary infections. Some warning signs are; dark, cloudy urine, strong smelling urine, blood in the urine. Often an increase in your fluid intake is all that is required but if pain, chills or a raised temperature are present it is necessary to see your doctor for antibiotics. Please consult your stoma nurse or doctor if you are concerned. With a urostomy you can shower or bathe as normal. You may choose to do so with the pouch on or off, but remember the stoma will continue to function. It is advisable to choose a soap or cleanser that does not leave a residue on the skin. There is no reason why a urostomy should restrict your ability to travel in any significant way. Just remember to pack all the things you need for the journey and to make sure that you have enough supplies for the duration of your time away. When flying, it is advisable to take all stoma supplies in you hand luggage just in case your main luggage goes astray. A small bag containing a new pouch, tissues and an disposable bags is always useful to take with you in your bag or pocket just in case. Your stoma care nurse will be happy to answer any particular questions you may have with regard to travel. Exercise is good for everyone and just because you have an Urostomy you are no exception. It is very likely that the exercise you enjoyed before the operation will be suitable afterwards. Obviously you will need to start with gentle exercise at first but soon you should find that you are able to do as much, if not more, than before.